Sarah is one of four young peregrines bred in captivity and released on the Kitchener City Hall in 2001. July 3 was the release date for the young peregrines, and just over one week later, Sarah was recaptured to be fitted with a satellite transmitter for participation in Project Track-'em to help us learn more about the fate of peregrines released in urban areas. Below is a summary of the data provided to us by Sarah over a period of approximately six weeks. Sep 17, 2001: (Concord). We are sad to report that Sarah has died. Her body was found earlier this month, but it was only yesterday that we were able to confirm her identity. She was discovered by a roadway adjacent to the large railyards in Concord, northwest of Toronto. Her severe head injuries indicated that she must have suffered a head-first collision with a vehicle, which likely killed her instantly. A very disappointing outcome for a bird which had shown such promise from an early age, and a sad reminder of the high rate of mortality among juvenile peregrines. Aug 30, 2001: 43.6N, 79.3W (Toronto). Sarah again did quite a bit of traveling around Toronto and surroundings today. She began in northwestern Etobicoke, took a flight northwest to Brampton, and then reversed direction, ending up eventually near the tip of the Leslie Spit on the Toronto lakeshore. Aug 26, 2001: 43.8N, 79.5W (Vaughan). Some additional data has come through today regarding Sarah's travels yesterday, showing that she did quite a bit of traveling in the northwest part of Toronto. The first report came from around Downsview Park. She then headed on to Vaughan as reported previously, and continued to Maple after that. She then drifted east toward Elgin Mills, before moving back west again to end the day in Woodbridge, only a couple of kilometres south of the Canadian Peregrine Foundation's Birds of Prey Education Centre at Kortright! Aug 25, 2001: 43.8N, 79.5W (Vaughan). Sarah doesn't seem to know which direction she wants to go in yet! After heading all the way east to Peterborough, she's now more than halfway back home to Kitchener again. Today we heard from her a few times in the area of Vaughan near Highway 7 and Weston Road - an area which has been frequented by past Project Track-'em peregrines including Magellan and Nate. Aug 21, 2001: 44.5N, 78.4W (Buckhorn). Sarah is off traveling again! It appears that she settled for the night near the small town of Buckhorn on the Trent-Severn waterway. Earlier in the day, she spent a while on the northern outskirts of Peterborough, roughly 30 km south of Buckhorn. Now of course we wonder whether Sarah will return to Kitchener again like she did following her visit to the Collingwood area, or will instead keep going on her own this time. Aug 16, 2001: 43.5N, 80.6W (Waterloo). For whatever reason, Sarah didn't stay up at Georgian Bay for long. By August 13 she was already back at the hack box in Kitchener, and she was seen there again the following day. Today's report that she's still nearby, although slightly to the northwest tonight in Waterloo. Aug 12, 2001: 44.5N, 80.4W (Craigleith). Sarah has left home! Several strong readings came in from the satellite today, all placing her near Craigleith, Ontario, on the south shore of Georgian Bay just west of Collingwood in the area of the Blue Mountains. This area is approximately 120 km north of Kitchener. Aug 7, 2001: 43.4N, 80.5W (Kitchener). Once again, Sarah has reported to us from near downtown Kitchener, though this time slightly to the south of the city centre where she has typically been in the past. Aug 3, 2001: 43.5N, 80.5W (Kitchener). Today's reports from Sarah showed that she was moving around town considerably, but still staying relatively close to the Kitchener City Hall at most times. Jul 29, 2001: 43.6N, 80.6W (Kitchener). Sarah is finally beginning to move around a bit. 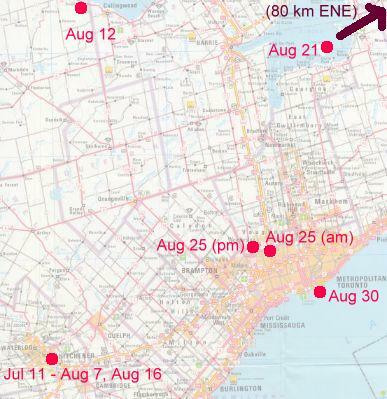 Today's reports had her both to the south and north of the release site at Kitchener City Hall, but on balance she spent most of her time a bit to the northwest. Her increased travel may be related to her growing independence - see the Kitchener news page for details on her first successful hunt three days ago. Jul 25, 2001: 43.5N, 80.5W (Kitchener). Two full weeks have passed since Sarah received her transmitter, and she remains in downtown Kitchener. Jul 20, 2001: 43.5N, 80.5W (Kitchener). Again tonight, Sarah is located in Kitchener near the City Hall. Jul 16, 2001: 43.5N, 80.5W (Kitchener). Not surprisingly, tonight's satellite transmitter report indicates that Sarah is still in downtown Kitchener. This corresponds with observations from recent days that have confirmed her presence in the vicinity of the City Hall. Jul 11, 2001: 43.5N, 80.5W (Kitchener). Sarah's first signals came in just hours after her release, and the coordinates confirm her position near downtown Kitchener. For details on the transmitter attachment process, see the Kitchener home page. Regular updates will be posted on this page as we receive signals from Sarah's transmitter.